Today from my side, here is some good information that will help you understand one of the most important part – Tooth and about the Jaw and sets of teeth! Teeth in humans are the most important structures which help in cutting, grinding or tearing the food particles which we take in. A tooth has mainly 2 parts – A crown and a root part. Humans are diphyodont, meaning that they develop 2 sets of teeth during their life. The 1st set is the primary set in which there are a total of 20 teeth, which are deciduous teeth. The next set is the permanent set which has a total of 32 teeth. Incisors in both the types of sets of teeth are named according to their positions – Central Incisors which are near to the midline, and they lie adjacent to each other. To their other sides, there are Lateral incisors. People often get confused with the Special “Wisdom Tooth” with the 4th molar, but the fact is that Wisdom tooth is the 3rd molar, which may never erupt if once formed in the mouth. This image would be helpful in explaining the times when the teeth erupt and fall in both the types of dentitions. 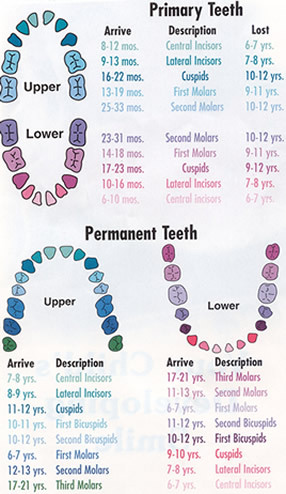 The primary set of teeth starts erupting from the age of 6 months till the age of 2 years in children. And these remain till 6 years of age, then the permanent set starts to erupt. At the age around 6 years of age, it is a mixed stage where both primary and permanent sets may be seen partially. Tooth has an outermost layer of Enamel, which is a transparent layer which covers the crown part of tooth above the gums. Enamel is the hardest substance in the human body. It is about 0.16 cm in thickness. It is helpful in protecting the inner layers of the teeth either by environmental changes or from bacterial attack. The inner layers are Dentin layer, which is similar to the bones of humans. Then cement layer coating and the innermost is the pulp which contains blood vessels and nerves, and it provides life to the tooth. Root canal treatment is done in the root of mostly pre molars and molar teeth. And as i have already talked to you, 9 Perfect Ways To Keep Your Teeth Healthy and How to brush your teeth?